On Friday it was just me and the girls at home as the boys were off at a friends house. With decorating our home right around the corner, I thought it would be helpful for the girls if they got to make a few Christmas decorations for themselves. 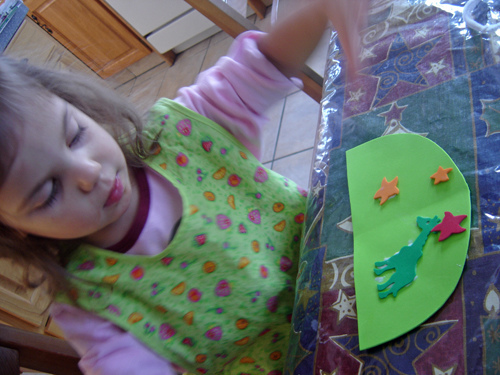 I wanted to up our usual crafting medium beyond the standard painting and coloring, with glue. 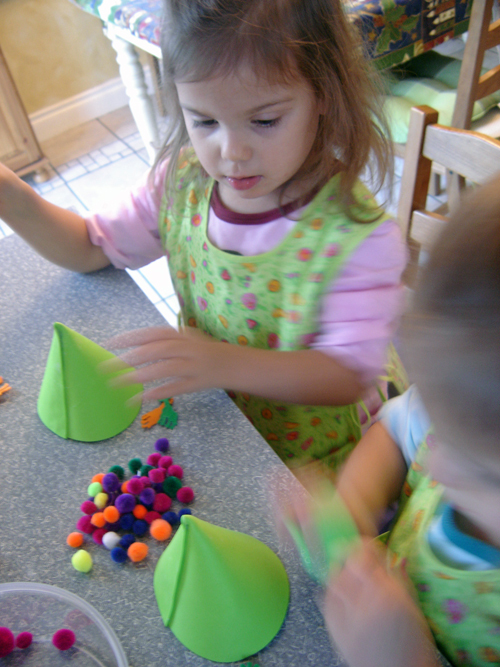 So with foam sheets, shapes, and pompoms we set out to make some Christmas trees. I cut the foam sheet in half to make two pieces and then trimmed it to a half circular shape. 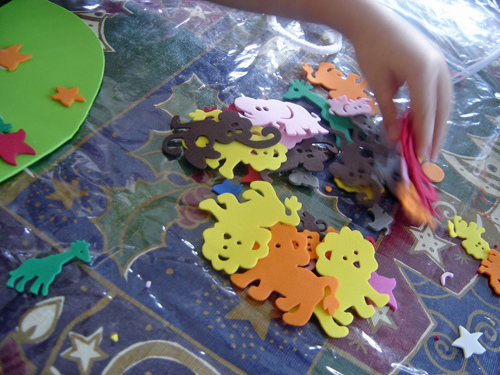 Next they monkeyed around with foam shapes gluing them on in various places. This was a really fun step for the girls and considering how messy glue can get, they did great! With a look on their face of "hey, I made this..." we set off to the counter work station where mumma's low temp. glue gun was heating up for another set of trees. 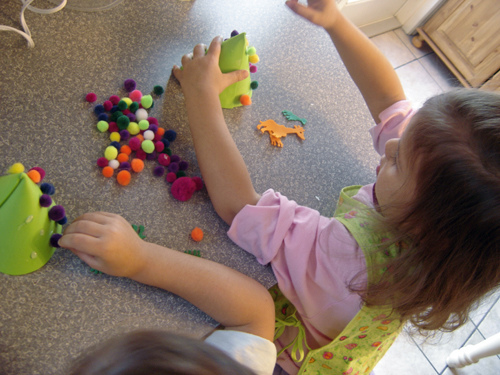 I'm not sure how it is in your home but my kids all love pompoms. They love rummaging through the bin that stores them, they dig them out, squish them, hold them, put them in their pockets and love making things with them. Thus making trees with (pompom) bulbs was an obvious choice for us. This is the same initial shape as the other tree which is just rolled into a cone shape with a strip of warm glue added to help the tree keep it's shape. 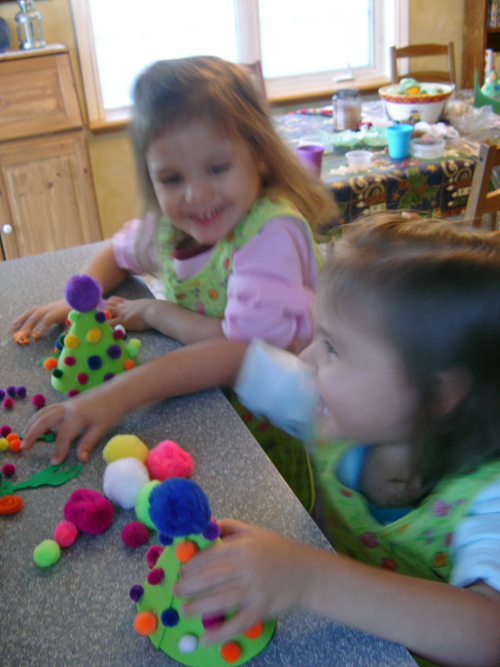 Next I put beads of glue on the tree and the girls went to work adding pompoms. I really love my low temp. 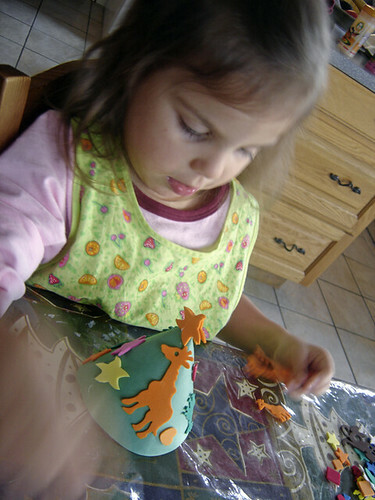 glue gun for crafts that involve the kids and it is really so much safer then the hot glue guns. Just looking at their faces made it all worth it! 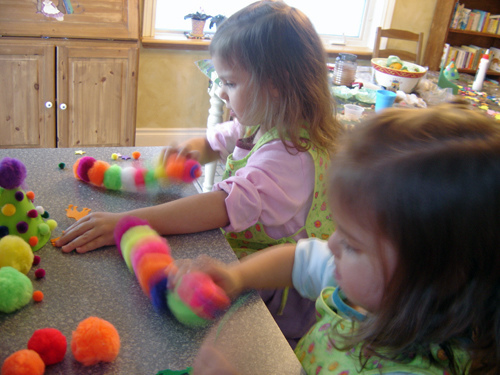 And what Christmas craft would be complete without a set of big furry caterpillars?? 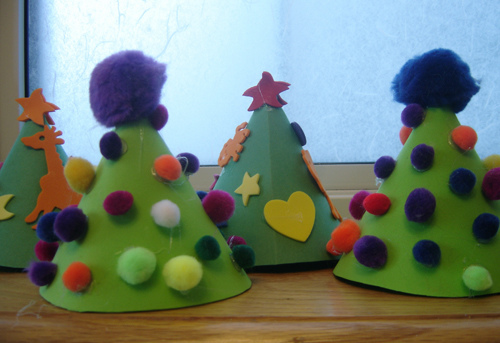 The final result is a glorious display of Christmas trees made by my two 3 year olds girlies. You might have to excuse all the bits and bobbles of glue on the trees but for this mumma I think they are delightful! Those are cute! 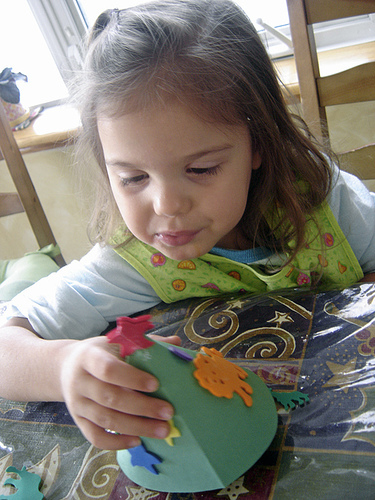 I love using those foam sheets with little ones. Love the pure delight on their faces. I think their little trees are the cutest.